My whole family is in love with this rustic style beef curry with fiery red , spicy gravy and big potatoes , whole or cut in big cubes . The process of making this kind of curry is very simple . But the flavor is unbelievable !! Onion , ginger , garlic are used in paste form and in a little larger quantity than usual . 1. Mix all the ingredients with meat except potatoes , garam masala powder and roasted cumin powder in a pot. 2.Put the pot on the stove and cook on medium-low flame with lid on . The meat will release water too .. Cook the meat adding water little by little , what we call in Bangla “koshano”, at least for 45 minutes . 3. Add water covering the meat . When the meat is half done add the whole potatoes and if cut in halves add little later . Cook with lid on . When the meat is done and the gravy comes to the desired consistency add the garam masala powder and roasted cumin powder . Turn off the stove and keep the pot on the turned off stove until oil separates . 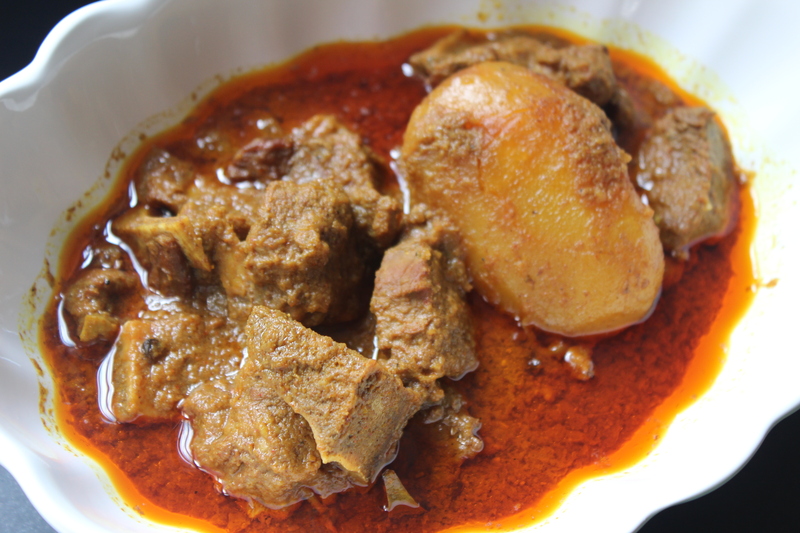 This entry was posted in Beef, Glossary / Notes, Meat and tagged bangladeshi style beef curry, beef bhuna, rustic beef curry. Bookmark the permalink. Apu can u plz give me garam Masala recipe? Apu can u pkz give me garam Masala recipe? Remove the beef recipes immediately or bear consequences.